At Foundry today we had a bunch of games of God of Battles. People are still building forces up and so there was much proxying, which was all reminiscent of the playtesting and a little nostalgic for me. Next month when we do it again I hope to see some more finished forces (mine too) alongside some more new faces so we can gradually build up a bigger group. More generals means more variety of armies and more fun playing different opponents. It also means we can mess about with mini campaigns and suchlike. It was also interesting to watch different builds on the same army type fighting each other and various opponents. One version beat up a lighter and shootier version of the same thing (Thousand Tribes), and then fought the T’lekkan and realised what fighty really meant. Mind you, if they’d bumped into the Blood Gorged who were kicking about they might have had a lesson there as well. All fun stuff. The next GoB bash at Foundry is on the 4th of May. 6 Responses to Clear Bases Incoming! t was an interesting game to watch,and gave one several good ideas about units and army ideas. One suspects that like many, you get stuck in the mentality of you have your general with your force and that’s your army. yet after watching the Thousand tribe with the amazing variety and some thing Jake said about allies makes the concept all the more interesting. Its a real strength one feels with GoB. It’s a bit of a monster in terms of area covered, so it didn’t get much use when I was playing Warhammer. Just got in the way too much. Not a bad piece though, just big. 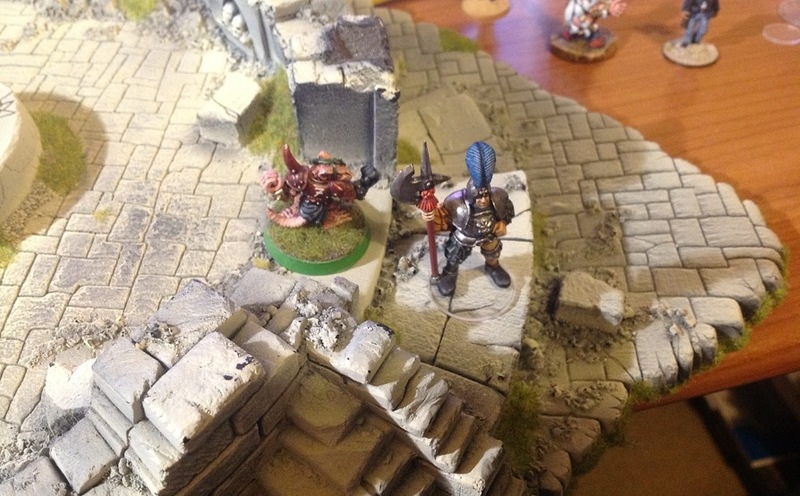 Yeah not practical for Warhammer, I used to use it as a scenic dungeon entrance for Warhammer Quest.